Baseball is a simple enough game. Yet, mastering the skills requisite to play the game at a competitive level, regardless of one's age, often isn't easy. 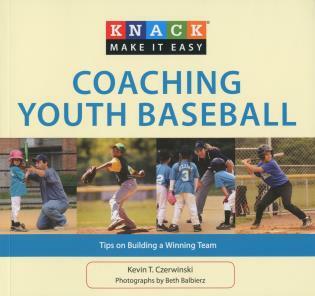 Knack Coaching Youth Baseball applies the unique Knack format—short passages of text linked to instructive photography of both boys and girls playing the sport, all organized into spread-based lessons—to present basic and advanced information about coaching this popular youth sport for kids aged five to fourteen. The author, a sportswriter who coaches his son's little league team, focuses on techniques that will help any team win while reminding coaches that children should have fun above all else. Kevin T. Czerwinski is a sportswriter who has covered baseball for MLB.com, the official Web site of Major League Baseball, since 2001. Currently he is a lead writer for MLB.com’s Minor League counterpart, MiLB.com. He is also a regular guest on MLB radio. He has coached son's Little League team for the last three years.